October is Support Your Independent Nursery Month as declared by Pam Penick at her Austin blog Digging. This week we visit Natives of Texas nursery in Kerrville. After our stop at Medina Garden Nursery we continued on State Highway 16 about thirty minutes to Kerrville and Natives of Texas nursery. Natives of Texas was founded on the idea that our Texas Hill Country natives are the best plants to survive the one-two punch of drought and heat of a Texas summer and the subsequent freezing weather of our winters. Their website shares the wonderful story of this nursery. Down the street and around the corner is a garden I enjoy seeing whenever I pass by. On a recent morning these cactus blooms invited a closer look. The blooms look similar to cereus and that's the closest I can get to guessing the name of this one. Those are Texas Bluebonnet (Lupinus texensis) rosettes in the gravel just waiting to make their spring showing about five months from now. Good thing I stopped when I did as the blooms were finished by the time I saw them again later that same day. I've posted about this garden before and you'll likely see more from this lovely garden in the spring. October is Support Your Independent Nursery Month as declared by Pam Penick at her Austin blog Digging. I'm joining in by visiting local favorites around the San Antonio area and posting each Monday. This week the spotlight is on the Medina Garden Nursery along State Highway 16 just east of the town of Medina, Texas. After an hour of driving northwest from San Antonio into the beautiful Texas Hill Country I wasn't sure what to expect. What I found was a pleasant surprise. It felt a bit like driving up to someone's garden and that's just what it is. Medina Garden Nursery grew out of the owner's interest in native plants. The nursery is in Ernesto Cariño's yard and acreage along the Medina River where he and Ysmael Espinosa have built display gardens around his stone house to teach customers about the beauty and durability of native plants. You can read more of their story in this article from the Native Plant Society of Texas newsletter. The article relays the facts, but Medina Garden Nursery turned out to be even more than I had expected. A pretty and rustic cedar arbor welcomes you to come on in and see the selection. This week (October 14-20) is Texas Native Plant Week and I'm celebrating by highlighting native plants in my garden. We learn over and over that "you can't fight Mother Nature". Two years of drought and record heat here in San Antonio underscored the need to emphasize native plants in my gardens. As you might expect, the Texas natives came through with flying colors while even many adapted plants gave up over the past couple years. Plants like Gregg's mistflower (Conoclinium greggii) have kept bees and butterflies busy all summer. October is "Support Your Independent Nursery" month designated by Pam Penick at her Austin blog Digging. I'm joining in by touring San Antonio nurseries and posting some of my favorites each Monday. Today is Milberger's Nursery on North Loop 1604 at Bulverde Road in San Antonio. Milberger's is the first nursery I visited after moving to San Antonio back in 1995 and realizing that I needed some serious gardening advice. The staff patiently explained basic issues of gardening in San Antonio and I still fondly remember those first tentative ventures into the world of gardening among the rocks, oaks, and deer. Last Saturday I attended the Watersaver Landscape Tour sponsored by SAWS, our local water system. Six San Antonio gardens were on the tour, including five residences and one community garden. My favorite on the tour was the native plant garden in the Alamo Heights neighborhood northeast of downtown. The house is located on a downslope away from the street which can provide unique challenges for gardeners. This homeowner created a very natural feel to the gardens along the street and driveway with a wide variety of plantings. A garage was removed at street level and a circle drive added to allow plenty of room for plants at the top of the hill. Tomorrow the crew from Central Texas Gardener a local gardening show produced by KLRU, the PBS station in Austin, will visit my friend Ragna's garden for a segment of the show. Last week I stopped by to help with last-minute staging. The garden is ready, not surprising since it's always ready. I was there at the end of last winter when most of the plants were dormant and her garden still looked wonderful. October has been designated Support Your Independent Nursery month by Pam Penick at her Austin blog Digging. All through October I'm visiting nurseries in the San Antonio area and posting about them each Monday. This week I headed north on US 281 about nine miles beyond Loop 1604 to the community of Bulverde. Bulverde used to be out in the country, but is quickly becoming a northern suburb of San Antonio. I had heard about a new nursery with an interesting plant selection, so went to take a look. Unfortunately, Stoddard's was still closed at 10:25 AM on a weekday morning. This happens sometimes with small, family-owned businesses so if you are planning to visit during the week, you might want to call first. I took a few photos through the fence and it does look like a nice option if you live in the far north suburbs of San Antonio. There are always ideas for blog posts floating around in my mind waiting until something special nudges the idea into place. That's what happened when Cat over at The Whimsical Gardener blog wrote a beautiful post about nature's confetti in the fall. As she often does she inspired me to think about my own yard in a different way. It turned out to be a very special request because I've often thought of sharing these pretty dropped blossoms from our native Texas sage. Today I celebrate the first anniversary of this blog. One year of blogging. What else is there to say? Quite a bit actually. I've learned so much and had such a good time with my 147 published posts. In honor of the occasion I'm sharing a few observations. October is "Support your Independent Nursery Month" hosted by Pam Penick at her Austin blog Digging. I'm participating again this year by posting tours of five locally-owned garden centers in San Antonio each Monday. 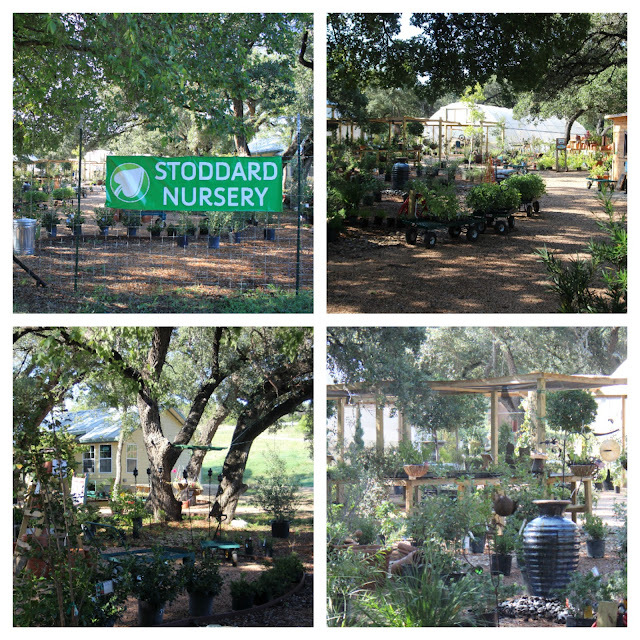 Our first stop this year is Shades of Green, a beautiful nursery northeast of downtown near the upscale Quarry shopping area in San Antonio.